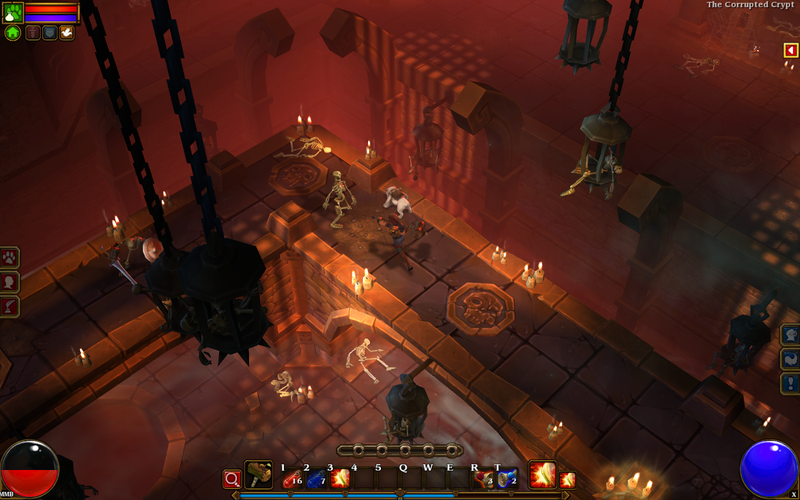 Torchlight II is the Diablo III I wish I had played. Runic Games’ sequel to the popular action role playing game Torchlight vastly expands the world while retaining the same classic game play from the first game. By continuing to use the same core mechanics, Runic Games has created a larger, more dynamic world without alienating their existing fans. 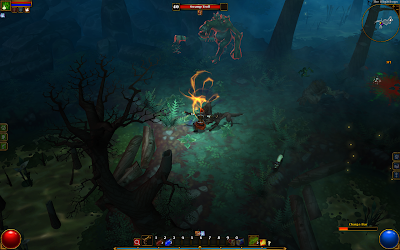 Torchlight II takes place several years after the first game with all new playable characters: the Outlander, the Embermage, the Berserker, and the Engineer. The story begins with your chosen character accepting a quest to follow the path of The Alchemist. After the events of the first game, The Alchemist has become obsessed with Ember and the Ember Blight. Eventually, he steals the Heart of Ordrak and, once again, the town of Torchlight is met with its demise. As The Alchemist moves from region to region gathering the magical energy of the Elemental Guardians, a new hero emerges at the Estherian Steppes to stop The Alchemist. Wastes, Grunnheim, and the Broken Mines. The flow and structure of the Acts are reminiscent of Diablo II where players moved from town to desert to forest and lastly, the underground. Quests are obtained by speaking to NPCs as the player follows in the wake of The Alchemist’s destructive path. Cut scenes provide the bulk of the story; however while beautifully animated, the cut scenes barely progress the story and lack depth. This is primarily a loot driven game with a simple story line: Stop the Alchemist before it is too late. The game play in Torchlight II has not changed vastly from the first to the second game. Item pick up, skill point management, enchantments, and fishing all remain more or less the exact same. What has changed is the landscape: Torchlight II is massive in comparison to Torchlight. 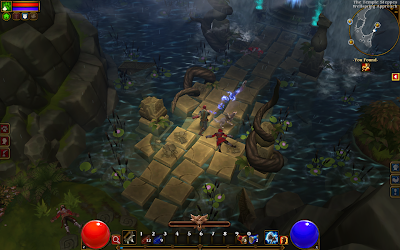 With the destruction of Torchlight, the game offers new regions full of a variety of seemingly never ending dungeons. There are more quests, more loot to be found, and more enemies. larger terrain, Torchlight II also boasts a day/night system with weather effects. I found the night cycle with adverse weather led to missing loot or having to go back to an area to ensure everything had been picked up. Players can also fast travel from one region to the next similar to Diablo II as well as customize their character’s gender, looks, and overall style. Torchlight II is more about customization and exploration than Torchlight. 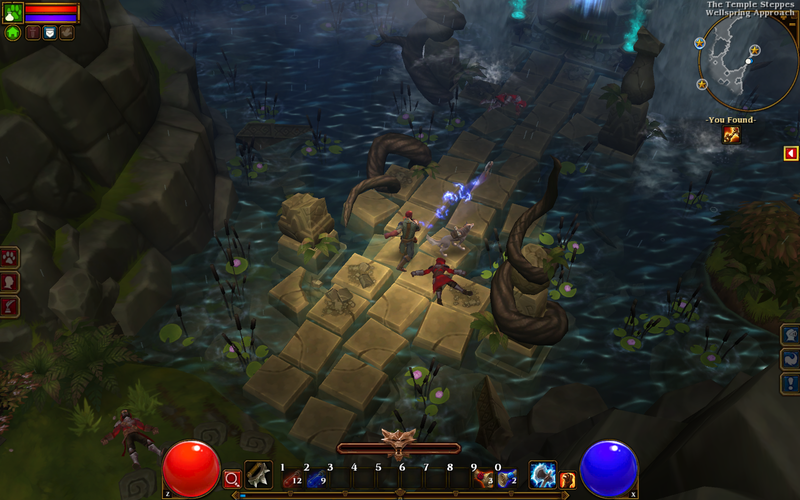 Similar to the first Torchlight, Torchlight II is all about inventory management and finding the best loot. As a bit of an item hoarder, this is always one of the most difficult aspects of any loot driven game I play. In order to help manage inventory, pets are back in Torchlight II. Your pet carries a decent amount of items and will sell your items so you can continue killing monsters without taking a break. Your pet’s battle stats can now be manipulated by a dog tag and collar. Collars and tags can be found throughout the game and greatly help your pet be successful in battle. I found myself rarely needing to heal my pet as a result of increasing its health through the use of enchanted pet collars. Another change in Torchlight II from its predecessor is the introduction of the New Game Plus option after completing the game. Players retain their inventory after completing the main story and all monsters start at level 51. The environments and quests are all reset in the New Game Plus mode in order to keep things refreshing for the second play through. In addition to the New Game Plus mode, players can also co-op the campaign online through the multiplayer. Players who have not completed the campaign once cannot play with New Game Plus players. The final change in Torchlight II is the introduction of GUTS on April 1, 2013. The GUTS system allows players to create their own mods for the game. Mods are available through the Steam Workshop and provide additional changes that increase the replay value of Torchlight II. Community generated mods help bring a vibrant, refreshing change to a game that could otherwise become stale. Game play has not changed considerably in Torchlight II from Torchlight, yet the additions have proven to increase an already immensely enjoyable experience. Torchlight II’s introduction of larger environments has led to an increased level of detail throughout the game. Torchlight II is far more polished and chock full of monsters in every area. Characters and monsters alike have received greater attention to armor design. Changing armor and weapons in the game drastically alters the visual appearance of your character. I particularly enjoyed this over the first game where everything felt very linear. Characters also feel fluid in battle as well as running areas. The overland areas encourage exploration and tiny details really add to the overall experience. A beautiful score accompanies the visuals to create an exciting atmosphere. I found the music to almost be encouraging at time when enemies were swarming. Dungeons at times felt incredibly eerie and scary as monster would occasionally pop out of an area unexpectedly. The combination of steam punk visuals and atmospheric music work exceptionally well in Torchlight II. Torchlight II is everything you want an ARPG to be. The excellent game play, endless dungeons, expansive environments, epic loot drops, and community mods have created a game that encourages the player to thoroughly explore the world of Torchlight in more than one play through. With a price point of $20 on Steam and the content of an AAA title, Torchlight II should be on every gamer’s list!